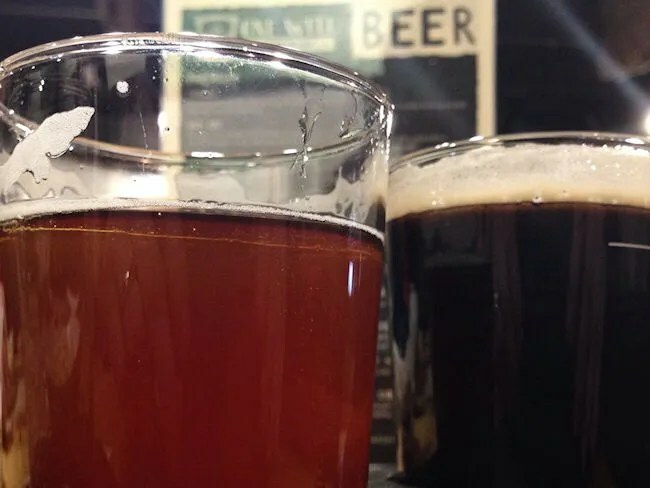 I love the boom of breweries in Kalamazoo. It is seriously awesome to have so many options. When a new brewery opens, I typically give it a little time if they don’t open with a food menu. I don’t really like drinking alone, so I’d rather be able to take my wife and daughter along for lunch. 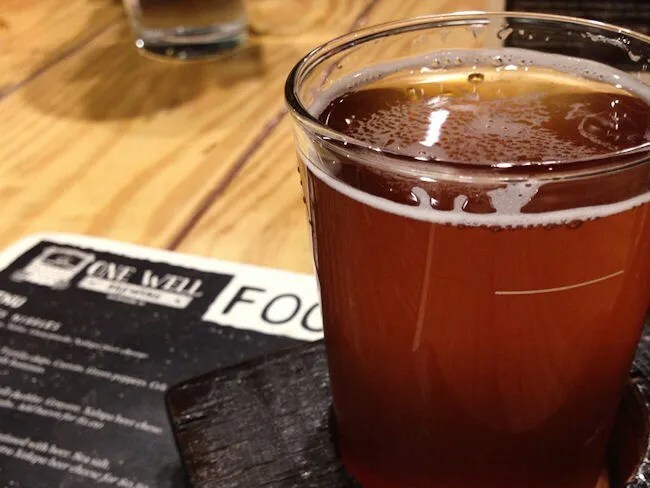 When One Well Brewing opened up last fall, they didn’t have a food menu. It was in the works, but they wanted to get the whole beer thing going first. Many Friday nights I’ve thought heading down there after the ladies go to bed and many a Friday night I ended up in bed myself before 9:00. A little over a month ago, the food situation changed. They added a small menu which is mostly appetizer type food and pizzas, but there was enough for the three of us to eat, so we finally decided to stop in for a quick lunch on a Saturday afternoon. 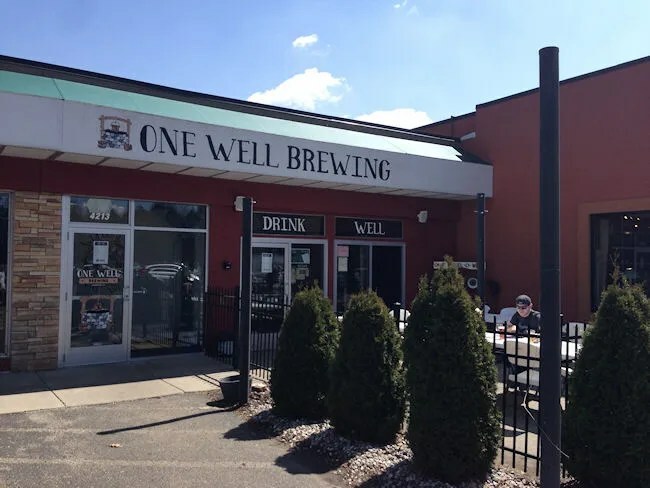 One Well Brewing is on Portage Street just to the north of the I-94 Interchange and Kilgore Road. The building actually used to be the home of Sunset Boulevard Brewing Company before they decided the neighborhood was too rough for them and they bailed. Not much has changed with the set up of the restaurant. There’s still a huge horseshoe bar right as you walk in and a pretty large dining room with a variety of seating options. They’ve also installed a couple of classic video game and pinball machines along the back wall. The three of us made our way towards the back of the space and sat at a table that shares a bench on one side with a number of other tables in the dining room. There was a food menu and a drink menu already on the table, so we started looking it over. The bartender came over and asked if we had been there before. We had not and he pointed out they “work like Bell’s” and food and drinks are ordered at the bar. As soon as we walked in the door, I saw others with flight boards, so hell, that’s what I was going to do to. J was just in the mood for a Sprite and we got L a glass of water. 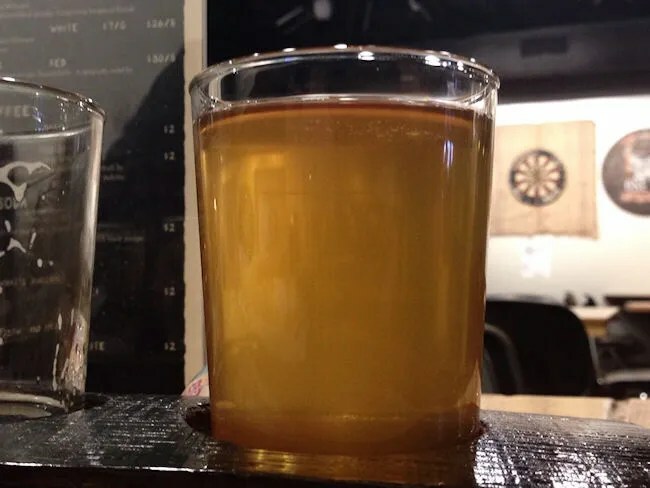 The beer menu has a couple of interesting selections including a jalapeno blonde which I’ve had at a different restaurant and a beer made with Sweetwater donut holes and Water Street coffee. I started my flight with a couple of safe bets. First one up was Whoppy. It’s a hoppy wheat ale with a hint of a citrus flavor. It was a really delicious, crispy way to start the flight. Next up was their IPA. It’s called SimcoeRillo because it’s made with Simcoe and Amarillo hops. Not a bad IPA. Very crisp and refreshing with a good hoppy taste to it. Beer number three was called Don’t. It’s a porter. That’s about it. It was smooth and delicious. Everything you want in a porter. The fourth beer is the one I’ve been really wanting to try. It’s called Sweet Water Street. It’s an Imperial Porter brewed with donut holes from Sweetwater’s and coffee from Water Street Coffee Roaster. Breakfast in a glass. Seriously. A little sweet..a little bitter. Loved it and love the idea. The final beer is a rotating fruit infusion beer. The offering they had the day we stopped in was called Cherry Ginger. This one was a surprise. The ginger really mellowed out the cherry flavor and made it palatable. I’m not always on board with cherry beer, but this one was quite delicious. Now that we’ve gotten through all the beers, on to the food. Like I mentioned before, not a huge menu, but what is on the menu all sounds delicious. J decided to share a couple of items with L. We ordered the Soft and Warm which is home made warm soft pretzels that have been infused with beer. 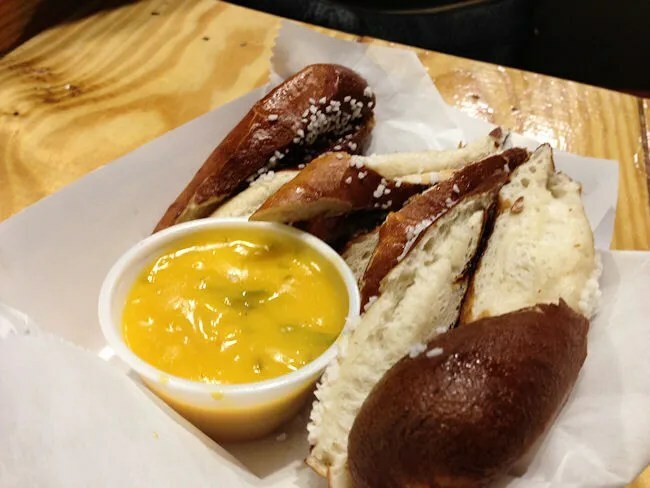 They’re topped with sea salt and served with Xalapa (the jalapeno blonde ale) beer cheese. The pretzels tasted like most pretzels do, but the beer cheese was amazing. 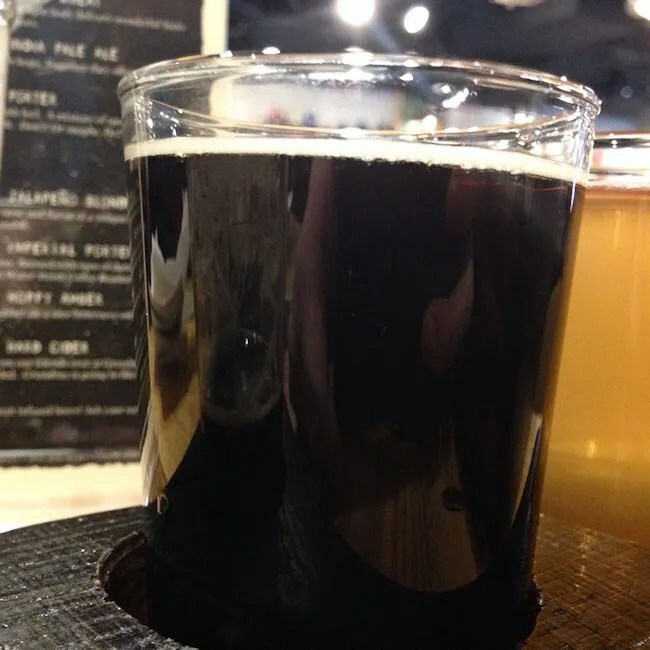 It had just a hit of the peppery taste from the beer, and that’s what made it so delicious. We also ordered the Child’s Play. 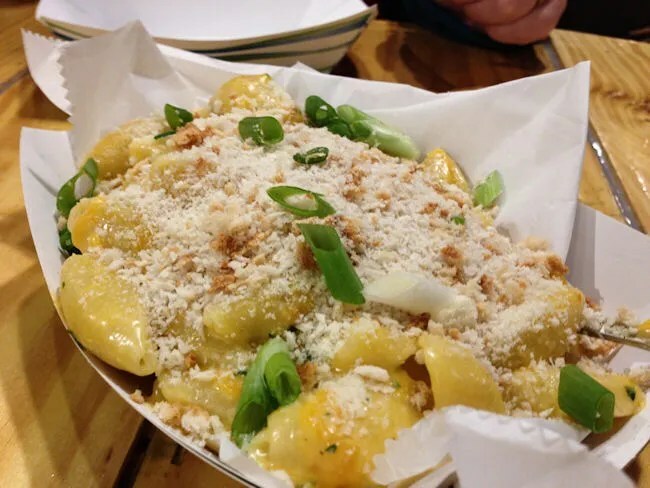 This tray of shell pasta is mixed in a cheese sauce consisting of Gruyere, smoked cheddar and more of the Xalapa beer cheese. It’s topped with chives and panko bread crumbs. Just like the sauce for the pretzels, it was the beer cheese that really stood out. Seriously, I don’t think there’s anything you could put that stuff on that wouldn’t taste delicious. For me, we ordered an Under Construction. This is their 9″ thin crust pizzas that are all on the build-your-own idea. I added pepperoni and bacon to mine. The pizza comes out super thin and very crispy. We thought L was going to eat some of the Mac & Cheese, but nope…she wanted the pizza. 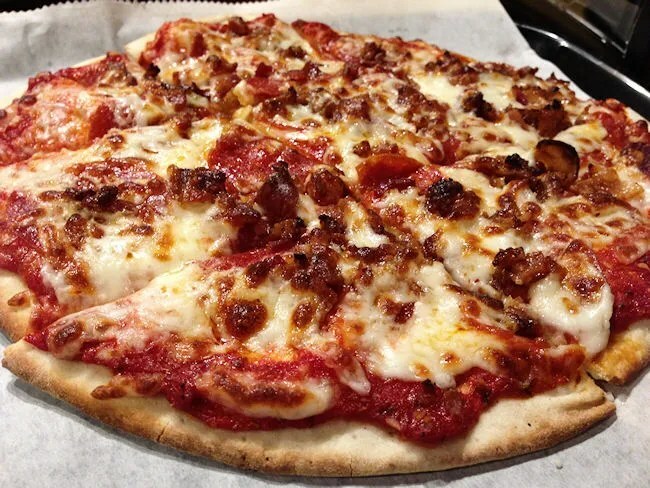 There were little crispy bits of bacon and pepperoni on top of the sweet red sauce and three cheese blend. The cost for all of that came out to just under $35. 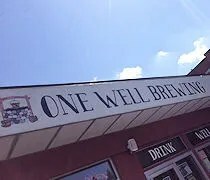 One Well Brewing is one of those places I’ve waited too long to visit. Everything was delicious. The food menu, while not very expansive, is all gourmet and delicious. The beer menu is more bigger than I expected and they seem to be trying some interesting things. 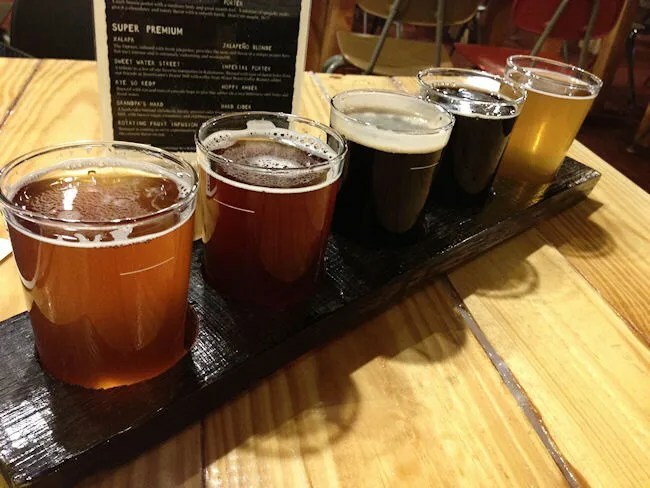 They are definitely a place to watch and a place to pop in to when you need some delicious beer and incredible snacks.